The IAAF World Championships take place in Osaka, Japan, starting on August 25th, and that week long event will be a feature of many of our posts over the next few weeks, where we look at the physiology and news coming out of Japan to explain what happens BEHIND the on-track performances. This may well be the most unpredictable track event of the entire Championships. The 800m race is difficult to call at the best of times, but in the last 4 or 5 years, no single athlete has grabbed the event and dominated it in the manner of Kipketer in the late 1990′s. Any one of about 6 men could win this race. Some have unrecognizable names, having been bought by Qatar or Bahrain, having been Kenyans in a former life. South Africans have a special interest in the race, with Mbulaeni Mulaudzi (right) the number 1 ranked 800m runner in the world this year. Any other event, he’d be the favourite, but the 800m is nothing if not unpredictable. So much of the race is tactical, and the fastest man in the field may well finish last if he positions himself incorrectly with 300m to go. The speed of the race makes it incredibly difficult to check, move around athletes in front and then come past, so tactical errors which go unpunished in any other race are fatal in the 800m. Physiologically, the 800m race is also one of the most interesting in the sport. We’ll feature a detailed description of the physiology closer to the race (2 September), but basically, the race is won over the final 200m by the athlete who slows down the least. This makes it an intriguing contest between strength and speed – speed to finish fast, but strength to maintain speed that might even be less than that of opponents. 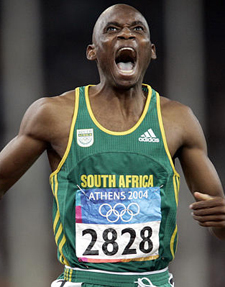 And Mulaudzi, should he wish to win, will have to move from 300m out, relying on his strength as a 800-1500m runner. In contrast, Olympic Champ Borzakovskiy is a 400m-800m runner, who will be favoured in a slow race. But again, there are no guarantees, any one could win this race, a possibility borne out by the fact that no runner has won two consecutive 800m races all year! So keep an eye on this one, it will come down to 4, maybe even 5 runners coming off the final bend, and then we’ll see whose physiology is most up to the task! This is an interesting race for two reasons: Meseret Defar and Turinesh Dibaba. These two Ethiopians have dominated the distance for the last 3 years and have featured in some of the most incredible races last season. Women’s running has been moved forward by these two, because of their speed over the final lap – never before have women finished a 5000m race with sub-60 second laps, racing one another all the way to the line. But that was a frequent occurence for these two. This year has been all about Defar – she smashed the 5000m world recrod (admittedly, the old record was suspect) earlier this year and looks in majestic form. But Dibaba hasn’t been racing, preferring instead to focus on training back home in Ethiopia. So she may come into the champs with great strength, and who knows what she may be capable of? The 5000m final is likely to be tactical, and in the past, that has usually (but not always) favoured Dibaba’s finishing speed, and even then, it’s been marginal. This will be a fascinating race – one potential confounder is that Dibaba is doing the double – 5000 and 10000m, and so it will be interesting to see how she holds up. Fortunately, the races are almost the full week apart, so she should be recoved in time. It will be a great race. For different reasons, the men’s 5000m race is another fascinating contest. Craig Mottram will race the Kenyans, Ethiopians and Qataris in an attempt to become the first non-African to win a major distance title since Dieter Baumann in 1993. It should be a great race, made more interesting by the fact that Bernard Lagat, a 1500m specialist until recently, will be doubling up. Whenever a 1500m runner steps up to the 5000m at a major championships, the rest of the field have a major problem on their hands. What do they do with a runner who is quite comfortable running 58 seconds a lap over the final 2km? This was the same problem that undid Kenenisa Bekele in the Athens Olympics when he raced El Guerrouj (admittedly, El Guerrouj was a different level of runner compared to Lagat). But that race was incredibly slow for the first 3km, and the final 2km was basically a 1500m strength session – Bekele never stood a chance. So Mottram has the same problem, he must determine how best to shake the man with the ability to race 54 or 55 seconds a lap. That means a fast start, fast middle and fast finish, which will make for an exciting race. Personally, I don’t think that Lagat will feature, he’s too erratic and not in the greatest form. Also, the 1500m qualifying rounds will take something out of him, whether he recovers remains to be seen. 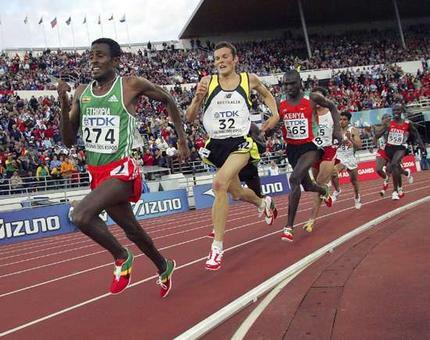 It’s a great shame that Bekele is not running this race, although that would like kill off the race for gold. But if ever he was going to double, this was it. But in his absence, it should be a great battle between Mottram and the Africans. But plan B was soon initiated, and she qualified for the 200m team instead. Since then, it’s clear that she’s worked tremendously on her speed. She recently knocked 0.23 seconds off her 100m best time, so it’s apparent that she’s adjusted the training in preparation for the 200m event. That can only be a good thing for her 400m future, but for World Champs, she should be in the sort of shape to challenge Allyson Felix. Felix, for her part, has also been in great form. In fact, she recently BEAT Richards over 400m, running a PB of her own. Admittedly, it was only two hours after Richards had run the 100m final in Stockholm, but it did demonstrate that Felix is super-strong. So as with the 800m, the 200m will bring together strength vs. speed. The strength of the 400m runner Richards against the speed of Felix, the 100m-200m specialist. The fascinating thing is that both have been focused on the OTHER attribute in recent times. So we have the strength specialist working on her speed, and the speed specialist working on her strength, and the women’s 200m final brings them together in what should be a great clash! So that’s it for our TOP 4 events, but they should all be great to watch. And we’ll be sure to bring you the insight and interpretation that you don’t get elsewhere, so join us over the next few weeks for IAAF coverage!